An Eau Claire original bar known for its mojitos and nightly bonfires, The Livery has a "vintage country meets modern urban" aesthetic. The bar offers regular happy hour specials and a wide range of beers, including 12 taps. There's a large outdoor patio with a bonfire at dusk nightly (if the weather's nice). A game room features a pool table, touch screen games, dart board, and the mounted heads of wild game on the walls. V1 readers frequently rank it highly for Drinkin', Talkin', and Indoor Games in our annual poll. Happy hour is 3-6pm daily and all day Tuesday. Closed Sundays and Mondays. This neighborhood saloon and grill is a refurbished historic livery stable full of iconic regional beer signs and decor. They serve upscale pub food with a modern touch, such as smoked pork (which is prepared in-house), fried cod sandwiches, fish tacos, pesto chicken sandwich, and bleu cheese stuffed steak, as well as other fun food and drinks with weekly specials. 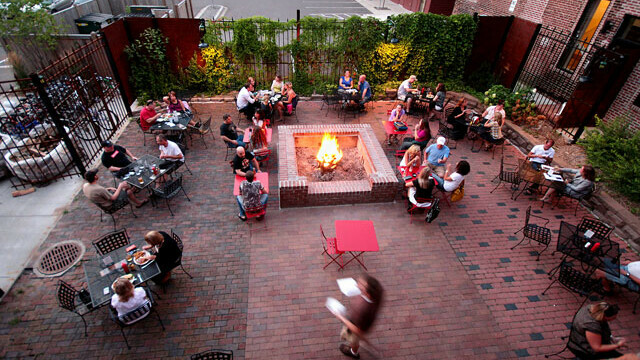 Outdoor seating with fire pit, open late. Closed Sundays and Mondays. The salad with the apple, goat cheese, and chicken is amazing, otherwise this place is not really worth it, I don't think. Been here a couple times, and have loved every visit. I have only gone during the even hours (past 6), and the place is usually fairly busy. First time we went was for dinner, second time was just for drinks. Both times the place was packed, but we still got noteworthy service for how busy it was. Old Fashioned drinks there are pretty good. Can't wait to go back! I like the livery, but the service is not very good! Last week we went, and we were never acknowledged by waitstaff. We sat drinking our beer for a half an hour and not one of the waitresses came over. Needless to say we did not end up ordering food. I do like that they have a small selection of tasty beer. THe back room with ski-ball, pool, video games and photo booth is really awesome. Although most times I have gone nobody is hanging out back there or everything is shut off. I will say that this place is much improved since my first few visits a couple of years ago. I love the back patio: nicely laid out and good atmosphere. Apparently my friends and I got lucky: our waiter was terrific: very fun, helpful, and attentive! The food was better: I had an oriental chicken wrap that was tasty: but I did ask for it to be extra spicy, per the waiters suggestion. mixed reviews from my friends, generally: food is ok.
We have visited this restaurant three times and have not been impressed. While I am not complaining about the country music, because I expected it to be played there, the volume was intolerable. Menu needs work with more options for people with food allergies and vegetarians. We sat at one of the high tables in the main area of the restaurant and I thought we were going to be on the floor by the end of the meal. Chairs were put together very poorly therefore wobbly and unsecure. My entrée left a lot to be desired on the first two visits but my burger on the third visit was very good. Love the design of the restaurant I just wish the rest of the environment was as inviting.